The night of the Prayer vigil at Copacabana Beach with Pope Francis was a crazy^3 time. Do recall that this was not Plan A to have it at the beach because Plan A involved a long trek to Guaratiba, which had flooded due to the week’s rains. So, I’m sure Guaratiba had the capacity to handle millions of people, but Copacabana does not. The purpose of Saturday night’s Vigil during World Youth Day is to share some time in prayer together with everyone and the Pope. There was some sort of theatrical drama/ceremony involving St. Francis and the cross, followed by a talk by Pope Francis regarding that. But after that, he initiated Adoration of the Blessed Sacrament, which in Catholic terms means to adore and worship Christ truly present in the Eucharist. Not just a mere symbol of Christ’s body in the form of a wafer, but the very body, blood, soul, and divinity of Christ under the appearance of bread. Because of our distance away from the stage/altar, we had to view what was going on the stage via big screens along Copacabana. We were between the last and second-to-last big screen. For whatever reason (due to me being distracted by the sights and sounds of the thousands around me, and the big screens not necessarily showing what was going on), I missed when Pope Francis exposed the Blessed Sacrament (Eucharist) in the monstrance. I didn’t really get the hint until I started seeing a bunch of people around our camp kneeling, because that is the usual posture whenever Jesus first gets exposed for Adoration. After seeing those around me kneeling, I knelt myself. It was cold and windy, but it felt comfortable to kneel supported by the sand underneath the tarp we laid out. Then the big screens started showing more frequently Pope Francis and his helpers kneeling before Jesus in silence. After a brief while, everyone I could see all around me was kneeling. Pope Francis asked for some moments of silence, and all conversations had stopped. No one really moved around. All were adoring Christ, even though we were multiple football fields away. The silence was loud, if that makes sense. Imagine the entirety of Copacabana Beach tightly packed with people…and all were in silent Adoration. The only sounds that I could hear were the crashing of the waves, and the rotors of an overhead helicopter or two. But other than that, no human voices could be heard. The silence was loud and profound to me. The silence seemed to expose the reality of this intimate moment between humans and Christ. This intimacy made for a legit, prayerful experience with a real, authentic encounter with Christ. And all this shared with others. See, this is what’s beautiful and awesome about being Catholic! We are united in the Eucharist, which is the source and summit of our faith. And to share these silent moments with our brothers and sisters gathered together from across the globe is an awe-inspiring expression of what it means to be Catholic. I felt joyful and peaceful to be here with all my bros and sistas in Christ with Christ! And like I normally do when in Adoration, I tried being intentional with my prayers consoled by the fact that yes, Jesus was right there on the beach. Sure, the silence was eventually broken by the crowds in the streets because they didn’t get the memo that we were in Adoration (hey, they couldn’t see the screen). And yes, they continued the Holy Hour with reflections and reflection songs. 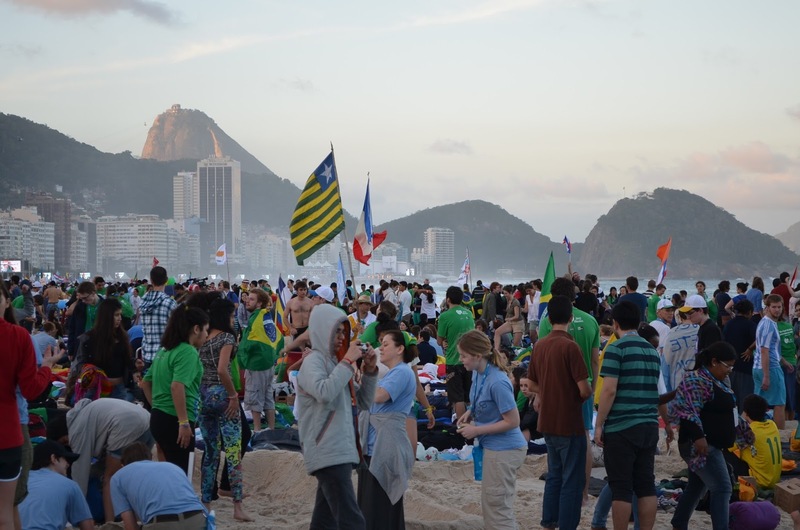 But in the small handful of moments in silence in Adoration there on Copacabana Beach last Saturday night, I remembered the reason why millions even gather for World Youth Day in the first place: to encounter Christ and His bride, the Church.